Simple Bird Applique | Making a quilt…..one stitch at a time. As promised, here are the dates for the spring Simple Bird Applique Retreat: Tuesday April 23-Thursday April 25. I have 5 spots left and I hope you can join us! The Retreat will be held at Fireside Retreat in Orillia, a wonderful venue designed for quilters. I have been working on a new block for the Retreat and here it is! The cost of the Retreat is $400.00 and includes all meals. Also included in the cost is a full-sized pattern for the Hummingbird in Flight, and, best of all, your freezer paper templates are already traced! Once you sign up I will send you a Fabric Requirement List and a Supply and Notion List. Please email me at burke.kerry@ymail.com if you are interested in joining us. 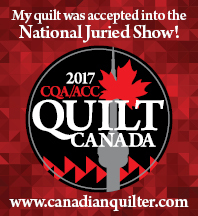 On Thursday Jan. 24, 2019 at 1 pm, I will be demonstrating my techniques for Prepared Edge Applique at the Simcoe County Quilt Guild, which is held at the Simcoe County Museum. Hope you can come! Everyone in attendance will go home with some freezer paper shapes so you can go home and practice. What am I working on? Well, every year around November, I long for some Christmas quilts to decorate the house. But November is not the time to start Christmas quilts, right? So I decided that starting in January, I would start Sue Garman’s “T’was the Night Before Christmas”. And so that is what I did. I am also working on getting my Hugs and Kisses quilt together. I am looking forward to hand quilting this baby! I took a couple of days to audition various brown fabrics for the swags. Bruin and I were unanimous in choosing the scrumptious Jo Morton fabric in the bottom right corner. It is a stripe so I had to make sure the swags were going the same way. Actually, we are having our whole house painted. It all started with replacing a bit of flooring. Isn’t that always the way? So I had to pack up my sewing area and keep out only a few things to work on. And I am working in the kitchen. Not a bad idea though. The counter is the right height and lots of lighting. Here are some of the swags prepped and ready to stitch the night away! The Academy of Applique is fast approaching…March 4-9. I will be teaching 2 classes this year and I am super excited! If you are thinking of signing up for classes, you have until the end of January…which is right around the corner! Block 12 is finished! Well, not completely finished. I still have a bit of stitching to do before I can call it finished. If you are doing the BOM, this is what your block will look like. Along with this month’s block, you will receive everything to finish the quilt….sashings, cornterstones and swags. Even the binding. It’s all in your next package, which should be arriving on your doorstep very soon. I am in the process of squaring up all of the blocks. Each block is 12″ finished, so I am trimming them to 12 1/2″ square. I am simply using my 12 1/2″ square to trim the blocks. Just make sure the square is centered on the block and away you go! Here are all 12 blocks! 2019 is approaching and I have some new projects to share with you. I just signed up for Esther Aliu’s 2019 BOM. I have been hunting for an applique project that will challenge me, and I think this is it. I will be posting pics as soon as I get started. I must confess I am totally obsessed with my most recent handpiecing project. I am working on The Handmade Quilt by Carolyn Forster. Very addicting. Of course, I love the fabric I am using, so that helps! The fabric is called Sun Kiss by Tilda. I bought half yard cuts of the whole line! Merry Christmas, Me!